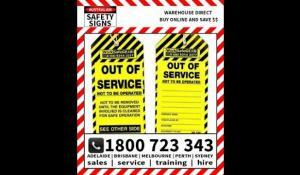 Order the OUT OF SERVICE Tag 150x75mm (Pk 100). Unbeatable prices on PPE and Height Safety products. Employee safety is paramount, which is why our out-of-service range is designed to help prevent the use of faulty machinery, warn personnel of equipment that needs to be repaired, and basically keep all staff abreast of which production tools to avoid.